Cloudforce NYC was held Wednesday and it was a thrill to participate with the other 10,000 or so at the Javits Center. Someone asked me what’s it like to be a new Salesforce ISV partner? My answer: really great so far. Just look at this week’s mobile AppExchange announce! Many of you may or may not know but Foretuit is a brand new AppExchange partner, barely 5 months since our first security review and posting to the AppExchange, and less than 11 months since we were first introduced to Salesforce’s ISV team (kudos to Andres, Nicole, Leyla and Ron). The old adage is never more true — you are the company you keep. And, in the case of the Mobile AppExchange announcement, we were asked to participate first, and second, we welcomed the opportunity to be among a small subset (less than 5%) of the 750 appExchange partners currently in the ecosystem. We seem to be enjoying a reputation as a motivated and cooperative partner with an industry-defining social sales analytic application. The outcome of our involvement with Salesforce to date has greatly exceeded our wildest expectations and conformed very nicely with our market approach. To get a jump on the Cloudforce announce, we demo’d our app to nearly 1,000 members of the NY Tech Community the night prior — and the response was nothing short of tremendous given the tweets below and post-demo feedback. “@edyson: At @nytm@foretuit real standout. Visualize your sales. Just made a @foretuit sweatshirt sighting at #CloudForce. Dayglow is really ugly but great for attracting attention. very cool product! liked the demo, puts sales in a whole new perspective! 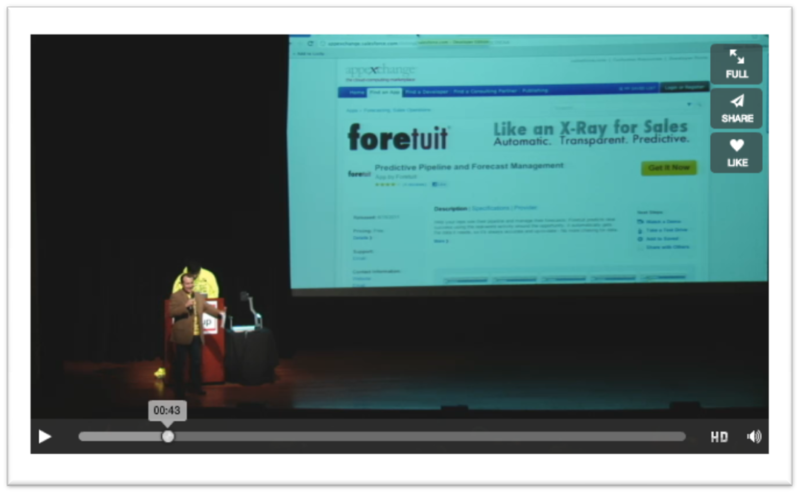 Great presentation, making sales management smarter and efficient @NYTM#nytm Great tool! Foretuit (only enterprise company tonight?) aims to make all that CRM sales data clearer for everyone. We’re excited about the pending ISVforce announcement and look forward to a long and healthy relationship. The momentum around the Salesforce.com ecosystem is real and perfectly suited to any new or existing venture. With ISVforce, we’ll see a greater commitment from Salesforce to our mutual success. Meaning, Salesforce as a platform (notionally — PaaS or Platform as a Service) can only be profitable if the ecosystem that it spawns is healthy and robust. In fact, we’ve seen some customers making significant investments in the Salesforce ecosytem to the tune of for every $1 spent on Salesforce, they spend upwards of $2.50 more on AppExchange partners. Impact the ISVforce Roadmap: Not to suggest that we #OccupySalesforce or anything even close, but the thinking should be that ISVs have the opportunity to truly capitalize on the opportunity surrounding the Forcedotcom platform, CRM objects, Chatter, Database.com, and Data.com and create a truly compelling offering for customers — in much the way that Foretuit has achieved. Access to a direct Account Manager: Having an insider who knows the day-to-day is critical. Last count, Salesforce is 7,000 people and growing, and the Sales Org is growing faster. You need an internal advocate to provide assistance and navigation in order to be successful. Alignment with the SFDC sales teams in all geos. Perhaps the most critical element of any program is alignment with, and incentive of Salesforce’ direct sellers. Afterall, the notions around ISVforce and PaaS are very focused on selling to an installed base of customers (some 104,000+ at last count). That’s a very rich, fertile field of opportunity. Not to disparage my own fledgling brand, but Foretuit is an unknown to most, so the ability to coat-tail on an already significant investment in customer relationship is absolutely critical. We’re confident that the ISVforce team will get this right. Co-Marketing to support ISVforce partners: How the ISVforce team leverages Salesforce’ already comprehensive and impressive arsenal of marketing tactics and activities will greatly impact the success of the overall program. Will partners be asked to expend significant additional resource to participate in online and offline activities that help create awareness and knowledge of partner offerings? Or will there be specified partner opportunities like the Mobile AppExchange announcement this week? The answer seems obvious given recent experience, the latter is much more likely. At the end of the day, it seems clear that Salesforce really does mean it when they say my success is their success. That reliance on mutual success we believe is critical to creating a truly robust (and massive) cloud-based ecosystem that will create opportunities (and dominance) for many years to come. We are glad to be aligned and look forward to our first mover advantage! Hi Michael, is your company engaged at the ISV level where you share 15% of your net revenue with Salesforce.com? We are a directory level AppExchange partner and we are interested in this ISV level but we haven’t seen any specifics on the revenue sharing arrangement. Salesforce provides the LMA app for license mgmt, but there is no billing or revenue tracking that we can see. Any insight from you would be much appreciated.